When trendsetting women name their own sources of inspiration, we're quick to listen. So when we first received a tip about Linda Wright, we dove in to learn a thing or two about her. Wright is a true American in Paris. Born in Texas, the 69-year-old has called Paris home since 1978. She's the owner of Crimson Cashmere, a boutique in the city, and she's also taken to blogging and sharing her cool sense of style on Instagram. Linda has a knack for styling of-the-moment pieces (like killer Gucci loafers) in a way that feels especially timeless. "I want to think I am perceived as feminine," she tells us, "while my attitude toward daily dressing is more masculine-feminine." Although she shies away from using the word "style" when describing her outfits of choice, there is a narrative that connects each of her outfits. "Over the years, I have gravitated to a more pared-down look," she says. And while she notes that she tries to stay away from anything too designer- heavy, "I continually have a desire to update my wardrobe with something new each season." Read on to learn more about Linda and see what sets her style apart! WHO WHAT WEAR: How do you seek out trends? LINDA WRIGHT: Aside from the fact that I am passionate about fashion, my own business depends on it. My little boutique in the heart of Paris is a go-to destination when seeking basics in quality cashmere since its opening in 1984. However, it is imperative that the silhouettes stay updated. We are talking evolution and not revolution. I shall leave that area to the creative designers of the world. They have true talent, and I just have an idea. WWW: How would you describe your personal style? LW: Would you believe me when I admit this is a very difficult question for me to answer? If the truth be known, I think style is a sophisticated word for what I do! WWW: Do you have a favorite way of keeping up with the industry? LV: I am a subscriber to more online fashion magazines than I dare to admit, and blogs and Instagram give me a daily influx of images that keep my mind and imagination more than active. WWW: What do you find to be the differences between French and American style? LV: In my opinion, the French woman has more of an attitude that goes beyond her sense of style. We all might agree that a self-confident woman, whether she is wearing jeans and a T-shirt with boots or showing her perfect little black dress with pearls and carrying a Kelly, Birkin, or Chanel 2.55 bag, owns an intriguing personality. That woman automatically exudes style. This is universal. WWW: How has your style evolved over time? LW: Over the years, I have gravitated to a more pared-down look, a little more under the radar. Call me " homemade soup" if you like! I wear a little of this and a little of that but only with ingredients that nourish me. WWW: Are there certain pieces you wear now that you would not have at another point in time or vice versa? LW: Being age appropriate is something that hit me over the head one day. I woke up knowing my feelings had changed about wanting to own those key pieces that define a particular prêt-à-porter season. Honestly, it was liberating! LW: In the end, what I enjoy most is my ever-wandering eye while walking down the streets of Paris and observing individuals who have that savoir faire translated as style. WWW: What is your process for choosing what to wear? LW: There is never a day that goes by that my heart does not dictate something in my closet that I have a desire to wear. Hence, choosing my look for the day is definitely based on a feel-good piece of clothing or accessory, and I build around that. WWW: Do you have a daily beauty routine? LW: I will admit to never wearing makeup. Ever! Please understand that I can totally appreciate a bright red lip on other ladies, including both my daughters, but just give me a wonderful moisturizing lip balm. WWW: Any final style advice? LW: What is my advice for having style? Go with your heart first and foremost. The rest does not matter. Want more? 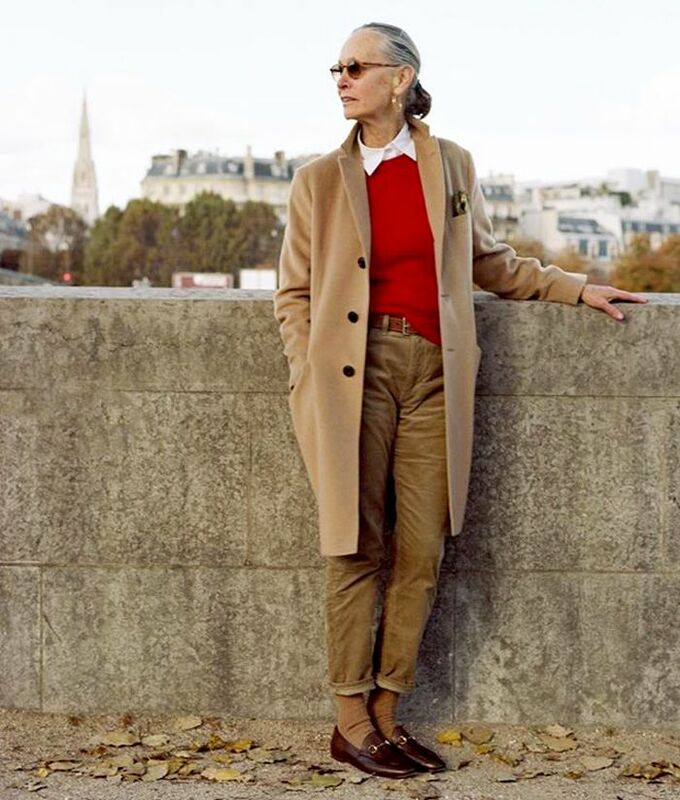 We know some over-50 women with amazing style!